During the late 1960’s and early 1970’s, the climate for blacks throughout urban America was one of coming together to express pride in their identity, to demand equality, to fight against racism and discrimination and to seek power locally and nationally. During this era, hope, optimism and a commitment to improving the quality of life for blacks were evident across the nation. While the issue of civil rights had been on the agenda of several civil rights organizations, such as the NAACP and the National Urban League, for many years, the events of the late 60’s and early 70’s crystallized the issue for most black Americans. The Civil Rights Movement was the primary impetus that moved black people from all professions and all walks of life to action. Black nurses were no exception. In 1968 and 1969, black nurse leaders in Los Angeles and San Francisco, respectively, who had visions of a better health care system for black people, where black nurses and other nurses of color played a prominent role in that system. They took action and founded the Council of Black Nurses, Los Angeles and the Bay Area Black Nurses Association. Meeting the challenges in Los Angeles were two visionary leaders, Betty Smith Williams and Barbara Johnson. A year later, black nurses in the San Francisco area were organized under the dynamic leadership of Florence A. Stroud and Carlessia Hussein in San Francisco. 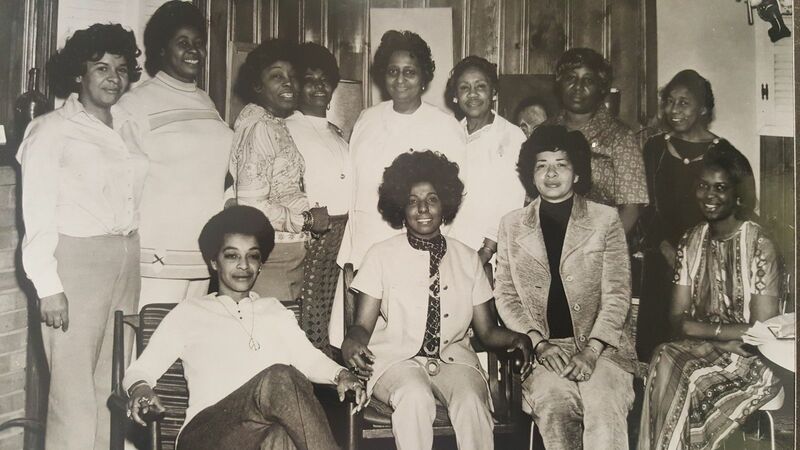 In 1970, the Los Angeles and San Francisco Bay Area black Nurses Association met and planned the first statewide conference of black nurses. The conference attracted black nurses from places as far away as Miami, Florida and New York City. (Williams,1976). The primary goals of the two associations were to unite black nurses to influence health care services for black people and to promote the inclusion of blacks in nursing education and nursing leadership positions. Three years later, due to the influence of some of the same nurse leaders from California, New York City, Indiana, and Ohio, these two goals became the cornerstone for the founding of the National Black Nurses Association. The founding of the National Black Nurses Association (NBNA) in 1971 marked a significant milestone in the history of black nurses in the United States, particularly in relation to their association with the American Nurses Association (ANA). Twenty years after the dissolution of the National Association of Colored Graduate Nurses (NACGH), which marked the end of one era in the fight of black nurses for equality and access to membership in ANA, there emerged again an urgent need for another national nursing organization with a primary goal of placing the black nurse in the mainstream of professional nurses. Although NACGN Chi Eta Phi Nursing Sorority had made tremendous inroads in removing some of the barriers for membership in ANA, black nurses in the late 60’s and early 70’s still had very little presence and influence in the leadership of the American Nurses Association. (Carnegie, 1986). Furthermore, black nurses who were members of ANA felt that their unique needs, as well as the serious health care needs of black people, were not being adequately addressed by ANA. Realizing that this situation was no longer acceptable, black nurses attending the 47thconvention of the American Nurses Association in Miami, Florida in 1970, “caucused” to discuss these issues, as well as to identify and discuss other common interests and concerns. This historic occasion was the beginning of the National Black Nurses Association as the professional organization for all black nurses across the nation! Over a meal of fried chicken and other potluck delicacies (as recently told by Dr. Mary Harper at NBNA’s 23rdAnnual Institute and Conference), the following black nurses laid the foundation for the establishment of the National Black Nurses Association: Dr. Lauranne Sams, Betty Jo Davidson, Gertrude Baker, Barbara Garner, Dr. Mary Harper, Mattiedna Kelly, Phyllis Jenkins, Florrie Jefferson, Judy Jourdain, Geneva Norman, Betty Smith Williams, Etherlrine Shaw, Anita Small, Doris A. Wilson, and Gloria Rookard. The founding members of the National Black Nurses Association recognized that in order to make a difference in the quality of life in our communities, black nurses across the nation had to take the lead. Through the founders’ collective vision, persistence and commitment, all black nurses now had an organization whose primary reason for being was to improve the health status of black people in the United States of America. As with any new organization the beginning years of the National Black Nurses Association were devoted to developing and agreeing upon an appropriate philosophy and mission, organizational structure, Constitution and By-laws and operating procedures. Officers, committee chairs and other founding members worked diligently to conceptualize and reach consensus on the philosophy, purposes and objectives for the organization. Only two months after the first historic meeting in Cleveland, the founding members had agreed on the philosophical statement, goals and objectives as well as the initial “ charter donation “ of $10,000 per member in preparation for formalizing the national association. Provision for the enjoyment of optimal health is the birthright of every American. Major health interest groups and governmental agencies believe this and move to act on it for the betterment of the nation. Yet, Black Americans, along with other minority groups in our society, are by design or neglect, excluded from the means to achieve access to the health mainstream of America. Since the above is true, we as Black nurses have established a National organization to investigate, define, and determine what the health care needs of Black Americans are, and to implement change to make available to Black Americans and other minorities health care commensurate to that of the larger society. Black nurses have the understanding, knowledge, interest, concern and experience to make a significant difference in the health care statues of the Black community. In order to implement the above philosophy, the founders agreed upon the following purposes and objectives for the national association. Define and determine nursing care for black consumers for optimum quality of care acting as their advocates. Act as a change agent in restructuring existing institutions and/or helping to establish institutions to suit our needs. Serve as the national nursing body to influence legislation and policies that affect Black people and work cooperatively and collaboratively with other health workers to this end. Conduct, analyze and publish research to increase the body of knowledge about health care and the health needs of blacks. Compile and maintain a national Directory of Black Nurses to assist with the dissemination of information regarding black nurses and nursing on national an local levels by the use of all media. Set standards and guidelines for the quality education of black nurses on all levels by providing consultation to nursing faculties and by monitoring for proper utilization and placement of black nurses. Recruit, counsel and assist black persons interested in nursing to insure a constant procession of blacks in the field. Be the vehicle for unification of black nurses of varied age groups, educational levels and geographic locations to insure continuity and flow of our common heritage. Collaborate with other black groups to compile archives relevant to the historical, current, and future activities of black nurses. Provide the impetus and means for black nurses to write and publish on an individual or collaborative basis. Over Twenty-five years later, the above philosophy and purposes and goals continue to guide the work of the National Black Nurses Association. The founding members also determined that a national organization designed primarily to unify all black nurses across the nation for the betterment of health care for black people should be inclusive in its membership. Recognizing that a major concern of the organization was to increase the number of black nurses in the country, the founders believed that incorporating all levels of black nurses into the organization would place them in a better position to influence all nursing education programs in which black students were enrolled, as well as the caliber of all nursing services provided to black consumers. Therefore, from the very beginning, membership was open to registered nurses, licensed vocational/practical nurses and nursing students. At this time, annual membership dues for RN’s and LPN’s/LVN’s were $10.00 and $2.00 for nursing students, and was included in the first NBNA membership brochure designed by Gloria Rookard, Membership Chair. During the Spring and Summer months in 1972, members of the NBNA Steering Committee continued to meet to address issues that needed to be resolved and tasks that had to be completed in preparation for formal recognition as a not-for-profit corporation. Betty Smith Williams, Interim Chairman of the Constitution and By-laws Committee had drafted the first copy of the Constitution and By-laws in April, 1972. Other speakers during this first symposium included Congressman Charles C. Diggs, Jr., from Michigan’s 13thCongressional District and the first Chairman of the Congressional Black Caucus. Congressman Diggs reported on the National Black Political Convention held in Gary, Indiana, in March, 1972, that brought together over 10,000 blacks from across the country. His advice to the black nurses was as follows: “We must have common goals and purposes which should be the reason for organized black nurses, because the white agenda has failed in terms of the black perspective. The second symposium focused on issues related to enhancing the recruitment, retention and progression of black students in nursing education programs. Speakers included: Arthur Grist, National Chairman of the Black Caucus of the American Public Health Association; E. Lorraine Baugh, who, at that time was the Executive Director of Nursing Education Opportunities in Boston, Massachusetts, Doris Mosley, Research Associate at Teachers College at Columbia University, Anita Small, representing the newly formed Miami Black Nursing Association, and Betty Smith Williams, the founding president of the Council of Black Nurses, Los Angeles. It is important to note that at the symposium, the Miami Black Nurses Association gave a donation to NBNA to aid in organizing all black nurses into a cohesive national body. It was during the final symposium, which was held on May 4, 1972 that the structure for the National Black Nurses Association began to emerge. The NBNA Steering Committee expanded and individuals in the audience were divided into regional groups fro discussion and action strategies for organizing locally. Phyllis Jenkins from New York City was assigned to the Northeast group, Anita Small, from Miami, convened nurses from the southeast, and Ethelrine Shaw and Dr. Lauranne Sams took charge of nurses from the Midwest area. Gloria Smith volunteered to convene nurses from the Southwest and Betty Smith Williams agreed to lead nurses from the West Coast. It was determined that through the regional areas, black nurses would be receiving feedback and would have the opportunity for direct input in planning for regional and national meetings and program activities. It is important to note here that during this same time, several of our founding members were also pushing for greater representation and involvement of blacks and other minorities in the programs of the American Nurses Association (ANA). Through their diligence and efforts, the ANA 1972 House of Delegates passed a resolution mandating the establishment of the Affirmative Action Task Force. Ms. Ethelrine Shaw was appointed Chairperson and Dr. Lauranne Sams, Betty Smith Williams and Janice E. Ruffin were appointed Task Force members. The specific goal of the Affirmative Action Task Force was to develop an action plan and program to ensure effective and ongoing participation of black and other minorities in the total program of ANA (Affirmative Action in Action, American Nurse Association, 1974). Participating in this very important forum provided our founding members with the unique opportunity and the support to go about the business of establishing the National Balck Nurses Association. During August 5 and 6, 1972, the NBNA Steering Committee met in Chicago, Illinois to discuss operational procedures, Constitution and By-laws, public relations activities, regional and national program activities, membership promotion, funding issues and, most importantly, incorporation. One month later, on September 6, 1972, in Canton, Ohio, Betty Jo Davison, Gloria M. Rookard and Doris A. Wilson, appeared before Cuff C. Brogdon, Notary Public, for the State of Ohio, and signed the official Articles of Incorporation of the National Black Nurses Association, Inc.! The following members are the original trustees of the National Black Nurses Association: Dr. Lauranne Sams, Dr. Mary Harper, Mattie Johnson, Betty Jo Davison, Gloria Rookard, Ethelrine Shaw, Betty Smith Williams and Doris Wilson.